Eagles Watch Party – October 7th 4PM – RSVP! Interested in Reserving a Study Room? Reservation Link open. Blood Drive – October 11th – 11-4 p.m.
“Halfway There” Celebration – Week 7! Welcome to Week 7! We’re halfway through the Fall 2018 semester. We will have fruit and snacks in the 2nd Floor Lobby from 11:30 a.m. – 1 p.m. on October 8th and 4:30-6p.m on October 11th. Faculty will be present so come say hello, have a snack and write a letter to your future self, a friend or a classmate — be encouraging, be funny, we will hand the letters out during exam period. Questions? Contact britt.walden@temple.edu. Breakfast (avocado toast and a juice bar) hosted by Ballard Sphar LLP. Breakfast from 10AM – 11AM. Dean Mandel will begin the day with brief remarks at 10AM. RSVP to britt.walden@temple.edu. Tuttleman Counseling Presentation. Join us as we welcome Dr. Daniel Dengel at noon in K1C as he talks about the services and programs to stay well. “To Hell and Back: One Lawyer’s Path to Redemption.” A replay of a YouTube live presentation featuring Laurie Besden, Executive Director of Pennsylvania Lawyers Concerned for Lawyers. K1C at 5 p.m.
As we approach the second half of the semester, please note that our student study rooms can be reserved by clicking this link and selecting “Reserve a Student Room” on the left side of the screen. Leila Afas, the Washington, D.C. based Director of International Public Policy for Toyota, will be speaking to the Temple University community on Tuesday, October 9 from 1-2PM in the 7th Floor, Alter Hall, 1801 Liacouras Walk. Leila Afas has an impressive career in government service and international business and has been an active participant in recent talks between Mexico and Canada over a revision to the North American Free Trade Agreement. After the presentation, Leila Afas will make herself available for a discussion with audience members. 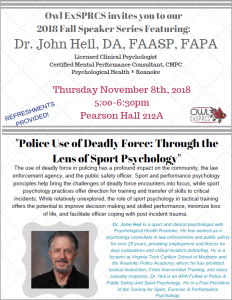 This event is co-sponsored by the Fox School of Business Legal Studies and Strategic Management Departments as well as Temple CIBER. There is no cost for admission. Please RSVP by following this link no later than 5PM on Friday, 10/5. Registration is offered on a space-available basis. Snacks and coffee will be provided. Join Judge Susan Maven on October 8, 2018 from 12PM-1PM in K2A. Judge Maven will share her story, her career path to the bench and her valuable advice on success in law school and life. Questions? Contact lcareer@temple.edu. 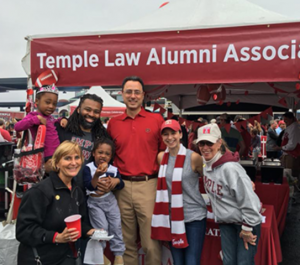 Temple Law students are Philly proud. Wear your Flyers gear as they kick off their first game of the season at home against the San Jose Sharks. The game begins at 7 p.m. on October 9th. Interested in Navy JAG? Plan to attend a presentation on October 10th – from 12PM-1PM – Barrack Hall, Room 200. Join U.S. Navy Office of General Counsel for more information on employment and the application process. Questions? Email lcareer@temple.edu. The Temple Law / American Red Cross Annual Blood Drive is scheduled for Thursday, October 11, 2018 from 11-4 p.m. Please consider donating – you can sign up here.